What’s the first thing that comes to mind when you think of summer treats? A few things come to mind for me…ice cream cones and sundaes! Basically I think of anything cold and sweet. I want to try to stay cool in the hot weather. A family favourite of ours is a Sundae dessert bar! I buy a few different flavours of ice cream, toppings like sauce, sprinkles, fruit and candies. Everyone always enjoys creating their own deliciously sweet masterpiece! It’s fun for kids and adults alike. It’s also fun to do at birthday parties too. I usually make my sundae with French vanilla ice cream, caramel sauce like Smucker’s Sundae Syrup Caramel Flavoured Syrup, pecans and peanut butter chips. SO GOOD! If I’m in the mood for chocolate, I’ll add a little Smucker’s Magic Shell Chocolate Flavoured Topping. It hardens as it hits the cold ice cream…like magic! Smucker’s has created some unique summer desserts that are perfect to serve at family barbecues, birthdays or just because. You don’t need a special occasion to indulge right? It’s the long weekend this weekend…perfect time! I’m so making these. Line 6 muffin tins with chocolate cups. Swirl 1/3 cup (75 mL) syrup into chocolate ice cream and scoop into cups. Freeze until firm. Swirl 1 tbsp (15 mL) syrup into softened vanilla ice cream and pipe onto chocolate ice cream. Decorate with sprinkles. Freeze until firm, about 2 hours. Makes 6 cupcakes. Line bottom of 8-inch (20 cm) springform pan with cookies. Top with Magic Shell Topping and arrange cones around edge of pan, so that bottoms of cones sit in topping. Freeze for 10 minutes or until firm. Fill base with strawberry or cherry ice cream. Make an indent in ice cream and pour in syrup. Cover with chocolate ice cream and smooth top. Freeze until firm, about 3 hours. 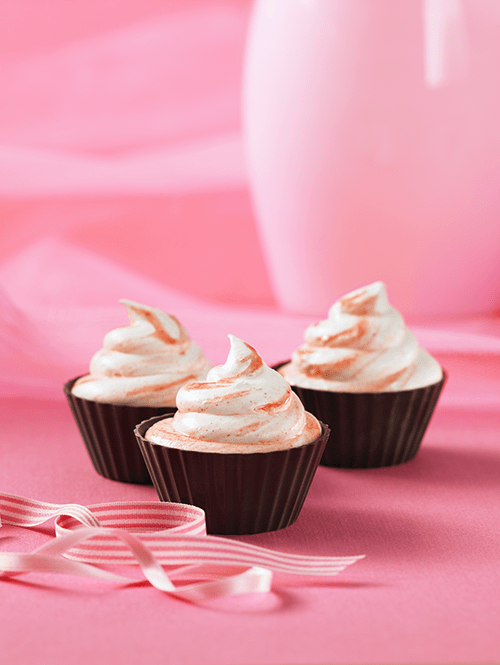 Decorate with whipped cream and sprinkles. Drizzle with additional syrup. 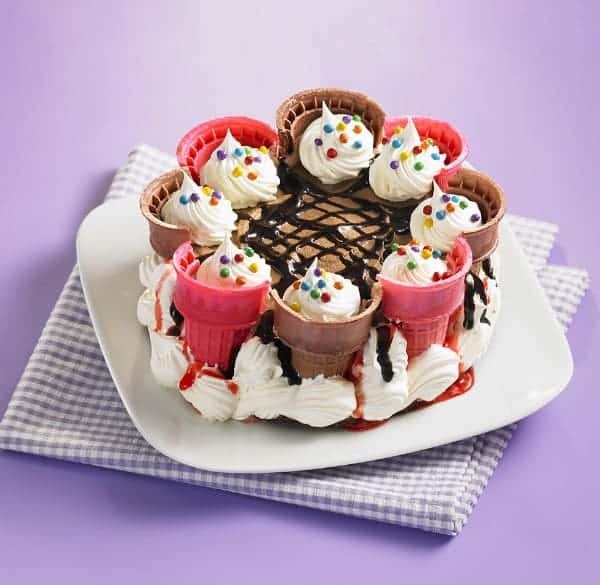 I think the Ice Cream Cone Cake would be perfect for my daughter Olivia’s birthday party in July. Ice cream cake is her favourite, but we’ve always purchased them. I’d love to try to make one myself. This one looks impressive and not that hard to make. 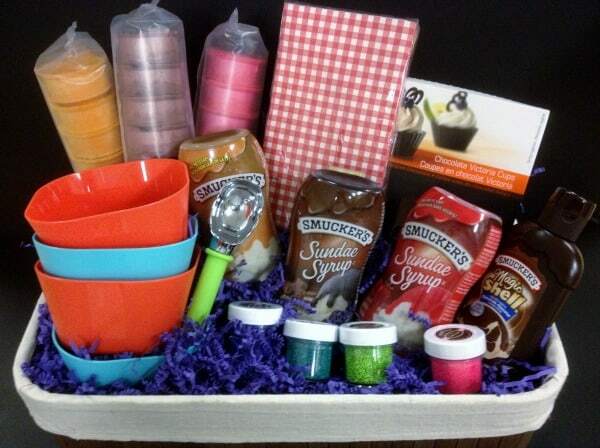 Check out other dessert recipes at Smucker’s. I have to say they are pretty creative!! i love crushed up reeses pieces!! Everybody in my family loves ice-cream! Melted peanut butter is my favorite, especially mixed with a bit of chocolate syrup! I love hot butterscotch or caramel on ice cream. i love to top mine with fresh fruit and chocolate fudge syrup! Smuckers jam is the only store jam I will buy.Strawberry only….